As an 8,000-tonne hull section of the Royal Navy's latest aircraft carrier begins a 600-mile (966km) journey around the north coast of Scotland, a team of cyclists has set off to try and 'beat the block' to its destination. The mid-section of hull, known as ‘lower block 03’, is the first part of HMS Queen Elizabeth to go into the dry dock at Rosyth. 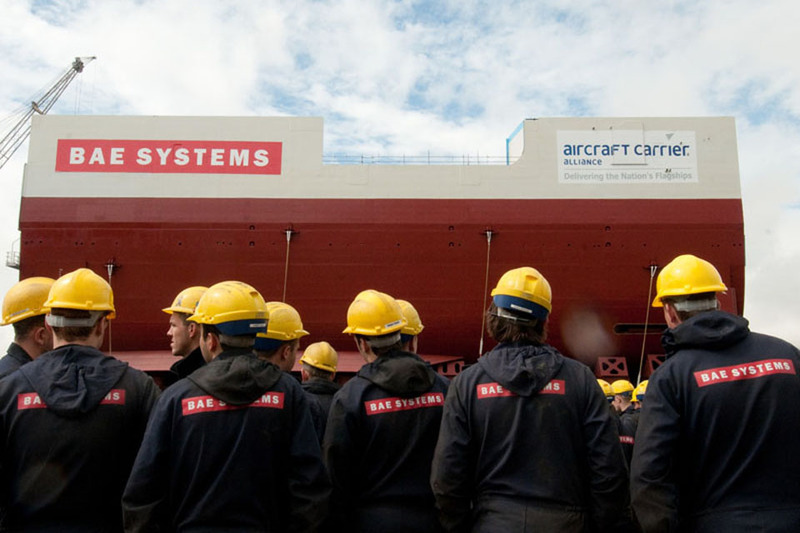 At 66ft (20m) high and 207ft (63m) long, it has been moved out of a hall at the BAE Systems shipyard in Govan, Glasgow, and is being taken by sea to Rosyth on the Firth of Forth where the aircraft carrier will be pieced together. And to mark the completion of the construction of the mid-section of the hull more than 50 cyclists left Govan on a 500-mile (805km) bike ride aiming to ‘beat the block’ to its final destination. The cyclists are attempting to raise more than £10,000 for the Royal Navy and Royal Marines Charity, stopping at Fort William, Elgin, Peterhead and St Andrews. 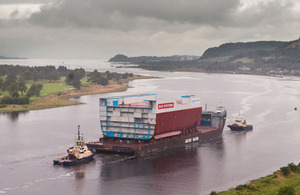 Watching lower block 03 be towed down the Clyde gives us a chance to reflect on the huge achievements of the past two years since we cut the first steel on this first section,” he said. The beat the block challenge gives everyone a fun way to get involved and it’s fantastic to see so many cyclists from across the Carrier Alliance taking part, helping to raise money for a charity that supports the men and women of our Armed Forces. This is a tough challenge and I encourage members of the public to show your support when you see the team cycle past. Excellent progress is being made on this project and it will form the cornerstone of the Royal Navy’s Future Force 2020. It is clear evidence that the UK shipbuilding industry has the expertise and experience to deliver a project of this size and complexity, delivering our next generation of carrier strike capability. The block will travel around the north coast before arriving at Rosyth on 21 August 2011. The 65,000-tonne ship, the first of two new Queen Elizabeth Class carriers, is expected to be operational by 2020. The new carriers are being built by an alliance of BAE Systems, Babcock, Thales UK and the Ministry of Defence, and will give the Royal Navy a four-acre (16,200 square metres) military operating base which can be deployed worldwide.